Android™ tablets and smartphones equipped with Intel Atom CPUs are getting more and more popular. 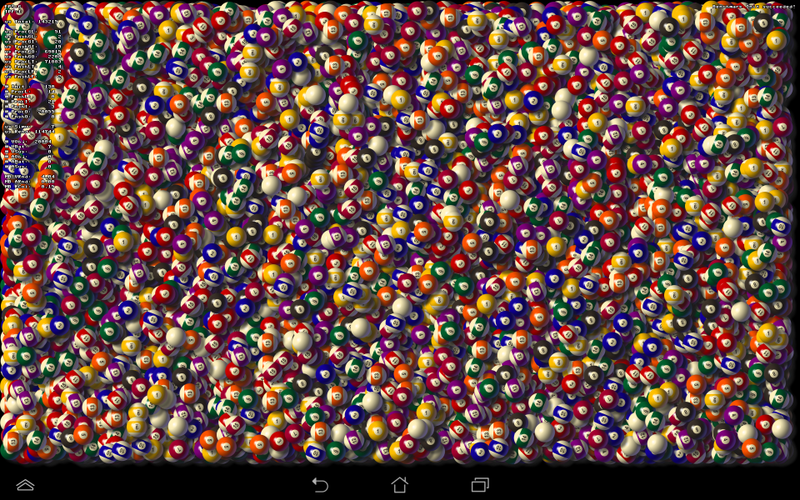 Therefore the Murl Engine allows creating Android™ apps with native x86-support since version 1.00.4754Beta. Originally all Android™ devices were typically equipped with an ARM CPU. Since 2012 also Android™ devices with Intel x86 Atom CPUs are available. Some examples of Android™ devices running on Intel Architecture are: Samsung Galaxy Tab 3 10.1, Asus MemoPad FHD 10, Dell Venue 7/8, Motorola Razr I, Lenovo K900 or more recently the HP 7. Intel developed a Binary Translator called Houdini which allows existing Android™ apps with native ARM code to run also on Android™ devices with Intel architecture. The Binary Translator reads native ARM code and on the fly translates it into equivalent x86 code. Hence almost every ARM NDK application will run also on Android™ x86 devices without modification. However the NDK bridging technology is slower and may cause problems in certain cases. Therefore adding x86 support is in most cases the preferred option. All upcoming releases of the Murl Engine will also provide precompiled libraries for Android™ x86 devices. The Android™ build scripts will automatically build and include also x86 Android™ code per default. The specified values correspond to the values of the APP_ABI parameter of the Android™ NDK build environment (ABI is short for "Application Binary Interface"). with Thumb-2 instructions und VFPv3-D16 hardware FPU. The Murl Engine build scripts additionally add the parameter -mssse3. This is safe because all x86 Android™ devices support SSSE3 (see also https://ph0b.com/improving-x86-support-of-android-apps-libs-engines). Further information about the different architectures can be found in the NDK documentation in the file docs/CPU-ARCH-ABIS.html. You can check the lib directory in your APK archive to verify that the correct libraries have been included. Remember that the .apk file is an archive file compressed with the zip format. You can e.g. rename it to .zip and view/extract the content with your favorite compression tool. The performance gain resulting from the use of native x86 code compared to the use of the Binary Translator obviously depends on the type of app, the used features and furthermore on the version of the Binary Translator. To get a better feeling we did some simple benchmark testing with the Murl Engine. Please note that this simple tests are not suited to deduce a general conclusion about performance gain you would see in production code. Hence, you may wish to do your own testing. An Asus Memo Pad FHD 10 was used as test device, which was generously lent to us by Intel. The tablet is equipped with a dual core 1.6 GHz Intel® Atom™ Z2560 CPU with an integrated PowerVR SGX544 GPU and has a 10.1 inch WUXGA display with a resolution of 1920 x 1200 pixel. 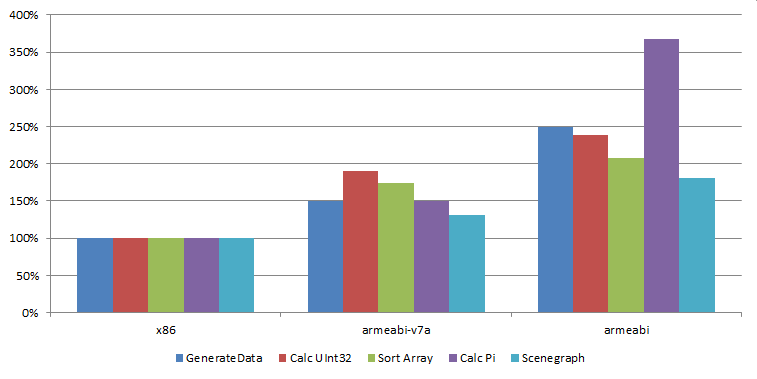 The test results with the Murl Engine show that on average the armeabi-v7a code runs 1.6 times slower and armeabi code runs 2.5 times slower than native x86 code. Detailed information about the performed tests can be found below. The additional x86 files will of course increase the overall size of the APK file. If the app size is a critical factor, you may want to consider splitting the app into individual APK files for every cpu architecture. When doing so, please note that the version code of the x86 APK needs to be greater than the version code of the ARM APK (parameter MURL_ANDROID_VERSION_CODE in the common Make file). Google Play will serve the compatible APK with the highest version number. Further information can be found in section Multiple APK Support of the Android™ developer documentation. An Asus Memo Pad FHD 10 has been used to execute the tests. The values reflect the needed processing time. Hence greater values are worse than lesser values. Create 20,000,000 random values and store them in three initial empty containers (UInt32Array, FloatArray, DoubleArray). Calculate a UInt32 value from the 20,000,000 randomly generated values in the container. Sort a UInt32Array with 2,000,000 random numbers using the quicksort algorithm. Calculate the number Pi using the Leibniz formula with 40,000,000 summands. Process a scene graph with 20,000 sprite objects which will be rendered on random positions.